You will need to take the backup of your database periodically to avoid any of your data from getting lost or corrupted. In case of a critical system error, you can restore all your data. 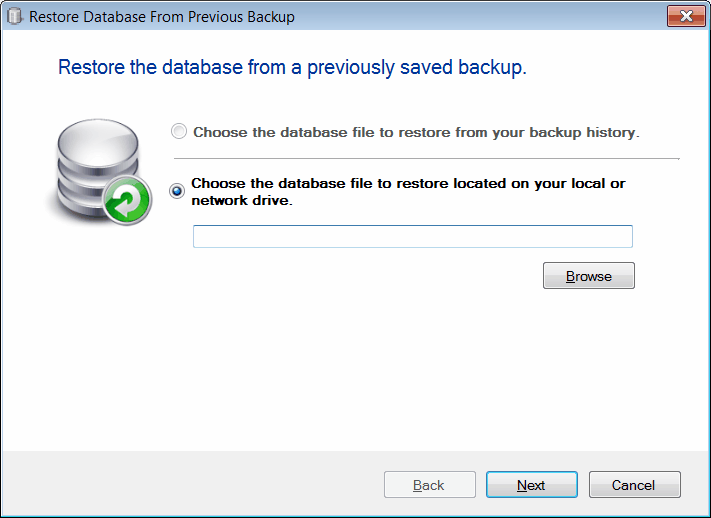 To take the backup of the database, click on Tools >> Backup Database. You will see the Backup Database Wizard. Specify the Backup path or location to store your database backup file. The default name of the backup file contains the current date and time. This helps you to know the date of the backup. Click Next after specifying the Backup path. The backup file of the database will be created at the specified location. To restore a database, click on Tools >> Restore Database. If you are logged in, then you will be asked to log off. After you log off, you will see the Restore Database Wizard. In this wizard, you will need to specify the file location by selecting the database backup file either from your backup history or from your local or network drive. After you have selected either of the options, click on Next. This procedure will restore the database. Once the restore process starts, all the connected clients will get a message and their connection with the database will be aborted automatically. 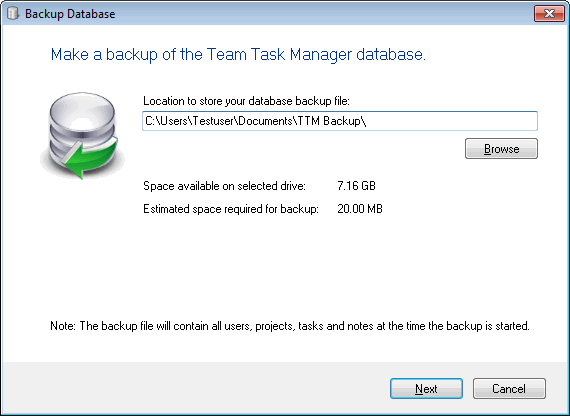 Note: For simplicity purpose, Team Task Manager supports a complete database backup. Other backup types like Differential, File/File group, File Differential are not supported.